Just a few quick things. Some of my favorite moments in ministry have been in prayer meetings. They have all but fallen out of practice in the modern American church. One of the things about Deer Flat Church is that it does have a heart for prayer. We have been endeavoring to raise the role of prayer and its importance during this month of March. I think we still believe that prayer is critical in both the church and our lives. Prayer is entrusting to God what only God can do. It is crediting to God what only God should get credit for. We want to be a praying church. I have always found it easier to do than to pray. Prayer often feels like one of the greatest fights of faith. But as we see in Scripture, it is a worthwhile fight. A praying church is a church where private prayer, gathered prayer, and spontaneous prayer are noticeable priorities. For us, disciplined and strategic use of time in prayer fuels the spontaneous and continuous prayer of which Paul writes “pray without ceasing” (1 Thess 5:17). I will tell you more about this tomorrow. I will also be reminding you about the CALL TO PRAYER tomorrow at 5 pm in the Sanctuary. Both the nursery and something for the children will be happening at the same time. This will not be a boring, dragging time. It will be an hour of focused pursuit of God and seeking His face. We have some very specific things we will be praying for. The time will go by fast and be amazing. I encourage you to set aside an hour for prayer. Probably one of the greatest things you’ll do this month. Come expecting, come with determined faith, and, why not invite someone to join you. Secondly – I want to tell you about a movie that is coming for 1 day only. It’s called UNPLANNED. A true story of a former Planned Parenthood director and an encounter that changed her forever. Abby Johnson quit her job in October 2009. That simple act became a national news story because Abby was the director of a Planned Parenthood clinic in Texas who, after participating in an actual abortion procedure for the first time, walked down the street to join the Coalition for Life. Unplanned is an impacting personal drama of life-and-death encounters, a courtroom battle, and spiritual transformation that speaks hope and compassion into the political controversy that surrounds this issue. It will be showing in Nampa on Thursday, March 29 at Edwards Spectrum 14. Show times are 7 pm, 9 pm, 10:30 pm. Turn out for this movie can send a strong message about the how important protecting the life of the unborn really is. Lastly – I just received the following update regarding House Bill 277. I can’t thank you enough for your efforts in prayer and phone calls to help make this miracle happen. 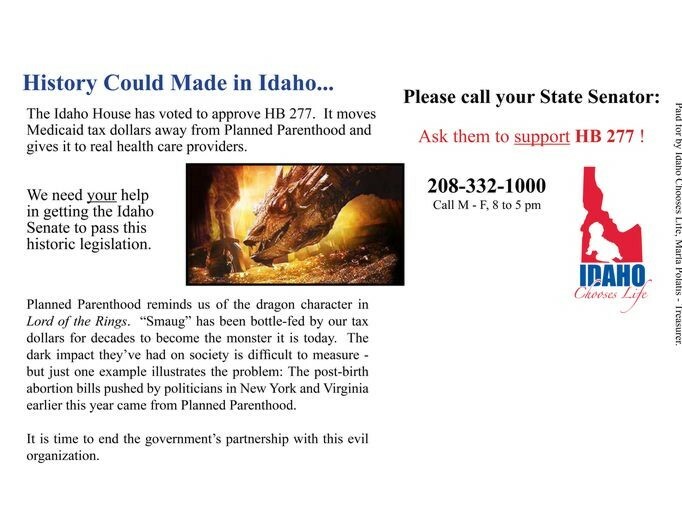 This is from David Ripley of Idaho Chooses Life. You can leave a message for all them by placing one call to the Legislative Information Center: 208-332-1000.And please do not forget to pray for this effort. HB 277 has national implications in the long campaign to break the illicit partnership between Planned Parenthood and taxpayers.